This recipe is a staple in my half vegetarian household. The carnivores don’t mind missing their meat dish when this is served. It is quick and easy to make. I typically shred all the cheese during the baby’s nap time so I am ready to go at dinner time. 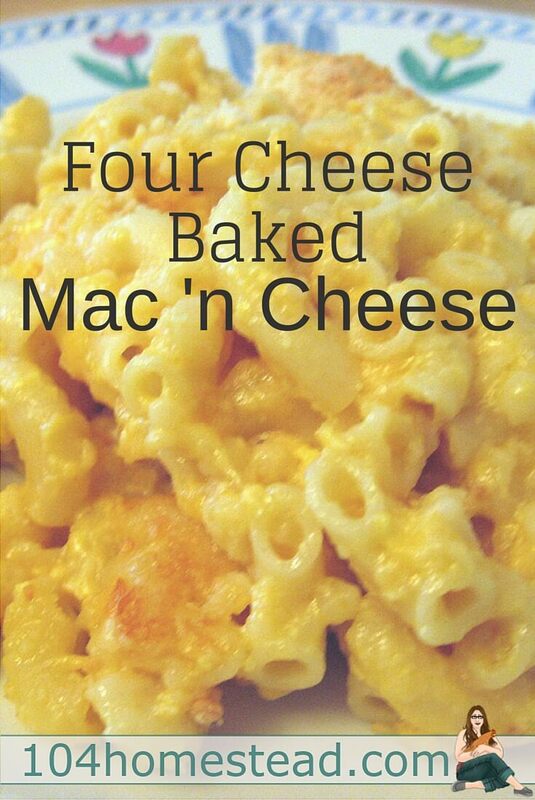 I recommend making this as a double batch. The cooking time accommodates two pans and it is very freezer-friendly. Having one in the freezer works nicely for the nights you don’t feel like cooking anything for dinner. Look at that wonderful cheesy goodness! In a medium saucepan melt 4 tablespoons of the butter over low heat. Add the flour and stir to combine making a roux. Cook (stirring frequently) for 3 minutes. Increase the heat to medium and whisk in the half and half a little at a time. Cook until thickened (about 4 to 5 minutes) stirring frequently. Remove from the heat and season with the salt, pepper, italian seasoning and 1 cuo of the grated parmesan. Stir until cheese is melted and sauce is smooth. Cover and set aside. Preheat the oven to 350ºF. While your oven is preheating, fill a large pot with water and bring to a boil over high heat. Add the macaroni. Return to a boil, reduce the heat to a low boil and cook until macaroni is very al dente (slightly undercooked). Drain in a colander and return the macaroni to the pot. Add 2 tablespoons of the butter and the garlic and stir to combine. Set aside. Using the remaining butter, grease a 3-quart baking dish or casserole and set aside. In a large bowl combine the remaining cheeses. Toss to combine. Place 1/3 of the macaroni in the bottom of the prepared baking dish. Top with 1/3 of the mixed cheeses. Continue layering until all the cheese and macaroni is in the dish. 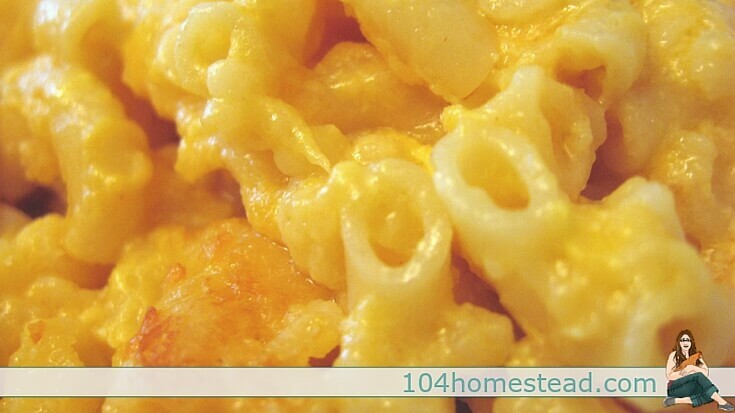 Sprinkle bread crumbs over the top of the macaroni and cheese. 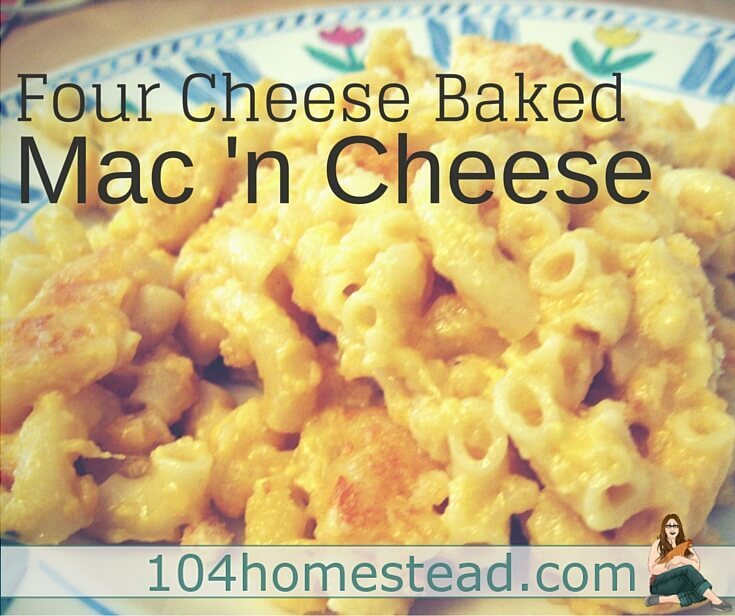 Bake for 40 to 45 minutes, or until the macaroni and cheese is bubbly and hot and the top is golden brown. Remove from the oven and allow to sit for 5 minutes before serving. Feel free to experiment with cheese and pastas. I have had great luck with bow tie, penne and rotini pastas. I’ve also switched up the cheese as well. So long as your cheese ratios stay about the same, you will have good luck with this recipe. What is your favorite home-style meal? Comment below. Click here for the printer-friendly recipe! This was a great recipe! All your measurements were spot on. Since you asked for feedback…you didn’t instruct your readers to add the roux to the pasta after the butter and garlic. Also, I would suggest making the pasta first or at least get the water boiling first so the roux didn’t sit so long. I saved a half cup of pasta water and added it to the pasta and the roux to thin it out a little since it had been sitting. I used White Cheddar, Emmentaler, Gruyere and Parmesan and used Campanella pasta. At what point do you add the Parmesan cheese sauce? You add it between layers of macaroni or mixed right in with the macaroni. Be sure to come back and let me know your thought if you try it. This is my first written down recipe (I’m one of those people who experiments and eyeballs measurements). I’d love some feedback.